This frazzled-looking chickadee parent has been frantically bringing food – mostly soft, fat green caterpillars – to its nest full of young in the days before the fast-growing youngsters leave the nest. June is a month for many things – graduations, weddings, summer vacation – but in the natural world it’s the season for baby birds. They’re coming of age and leaving the nest. Where are you likely to spot them? Keep an eye on the ground. When young birds are ready to leave the nest, many – no longer really babies – make a short flight, and some of them end up on the ground. As with pilots in training, they can fly, but the real challenge is landing. It takes practice and precision to alight on a branch. What if you find a young bird on the ground? Just leave it alone, but take the family cat or dog inside. The bird is probably keeping very still to avoid being noticed, and its parents are probably nearby, ready to give encouraging calls when the coast is clear. Most likely the youngster will fly up to a safer spot when you’re gone. Another place to look is, not surprisingly, up in the trees. If you hear a ruckus of calling and flapping and see several birds of the same kind in the branches, remember that it’s a bit early for most birds to be collecting in flocks for migration. You might be looking at a family group gathering or traveling around after the young have left the nest. Depending on the kind of bird, the youngsters may stay with the parents for a few days or a few weeks before they’re completely independent. Watch such a group if you find one. The youngsters are learning to find their own food, but the parents may still be feeding them. Even without binoculars, you might notice a parent giving food to a youngster, who’s about the same size as the parent. Feeding is a very quick move, so it’s easy to miss but fun to see. The water is a third place to find for baby birds. As you approach one of our lakes or ponds, you might notice a mother duck with a line of ducklings swimming after her. They’ll quickly disappear into the distance, or hide in the reeds on a far shore. In the case of water birds like ducks and geese, the young are well enough developed to leave the nest and swim in a group after their mother shortly after hatching. But they can’t yet fly, so they’ll stay with her until they can. Feeding chicks is a draining job for parent birds. (Human parents can relate to that!) Take our state bird, the black-capped chickadee (Poecile atricapilla). The frazzled-looking chickadee in this week’s photo has been feeding its young several times an hour throughout long spring days. There may be 6 mouths to feed. Once the chicks have grown enough feathers to keep themselves warm, the female joins the male in catching food for them. Before that time, the male chickadee performs extra feeding duty. 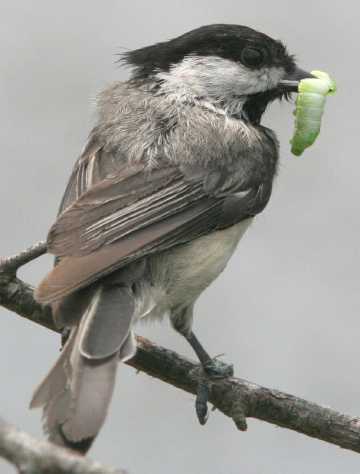 In early spring, a male chickadee begins to offer food to his mate. Sometimes you can spot this “courtship feeding” near a bird feeder. Later, while the female chickadee gathers nesting material and builds a nest, the male may fly around with her and offer her food. Then, when the female is laying eggs – one a day for 6-8 days – the male continues to supply her with much-needed extra nutrition. Finally, while the female warms the eggs on the nest – around the clock for 12-13 days, spending about 25 minutes on the nest and then 7-8 minutes off the nest – the male provides most of her food. Young chickadees are almost naked when they hatch, so the female spends most of her time on the nest for another 12 days until they’re well feathered. In this period the male brings most of the food for his mate and their chicks. The male’s work in feeding his mate throughout the breeding season contributes to her survival afterward. Studies show that female chickadees with older, more experienced mates are more likely to make it through the fall and winter months that follow. A female’s survival is also related to the position that she and her mate held in the hierarchy or pecking order of the previous winter’s flock. A higher rank is better, of course. It gives the pair better access to winter food and increases their chances of claiming a prime, food-filled territory for breeding in the spring. How do we know? Researchers put color-coded leg bands on chickadees so they can identify individuals and track their movements and fates. They’ve even found that female chickadees sometimes leave a lower-ranking mate to pair with a higher-ranking male. But, backing up a bit, where might you find a chickadee nest? Chickadees dig holes for their nests in soft, rotting wood. Look for dead stumps or snags, or trees with rotten places. Check dead trees in wet or flooded areas, or dying sugar maples (often weakened by road salt in the winter). Watch for chickadees flying back and forth with beaks full of wood chips. Some people put up nest boxes for chickadees. The box entrance should be only 1-1/8 inch wide and 6 inches above the box floor. People sometimes fill the box about one-third full of coarse sawdust to give the chickadees something to dig out. What does a recently fledged chickadee look like? It looks very much like its parents, who are similar to each other, but its tail is short. It may have traces of yellow around its mouth. – the remains of a bright yellow lining that helped its parents put food in its mouth in the dark nest hole. Young chickadees stay with their parents for 3-4 weeks as they learn to find their own food. The family moves around the local area until one day, the young suddenly fly off in separate directions, leaving their parents’ territory. In late summer or early fall, each surviving youngster will join a flock elsewhere. They’ll have a relatively low rank but with luck they’ll pair up, survive the winter, and breed in the spring.